A Money Saving Package. Get 2 Products For One Low Price. Stuff Points: Earn 60 points when you buy this stuff. Please see individual products for current availability. A 7 Piece Set. Save money when you buy these items together. You still get every single piece included in the V-Slicer Plus package, but you also get the Slice and Serve Bowl at a discounted rate. 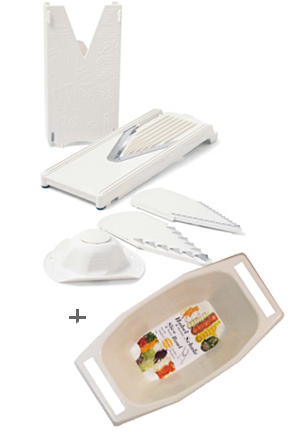 The Slice & Serve Bowl allows you to mount your borner slicer so that everything you slice falls neatly down into it. It can also be used as a serving dish. This part sells for much more if purchased separately, so buy them together and save. This combo pack is the most convenient way to enjoy the Borner V-Slicer Plus, and offers the best value for your money. Order your Slice & Serve combo pack today! Please see individual product pages for more information about the stuff in this combo. Dimensions 15" x 6 "
Borner V-Slicer - Get perfect, professional results every time with this unique food slicer. It's an affordable alternative to expensive stainless steel mandolines. Order Your V Slicer Today. Dimensions 13.75" x 7.25" x 3.5"
Borner Slice & Serve Bowl - High quality materials and craftsmanship make this German made kitchen gadget a must have. A great accessory for anyone that already owns a Borner Slicer. ONCE YOU OWN THIS SLICER YOU WILL NEVER WANT FOR ANOTHER. IT IS THAT AMAZING. I RECOMMEND GETTING THE BOWL WITH IT AS IT REALLY DOES MAKE IT EASIER. THIS SLICER SAVES TIME AND IS WELL DESIGNED WITH A V SHAPE TO HELP IT CUT FASTER. THE BLADES ARE SUPER EASY TO CHANGE OUT. YOU CAN SLIDE BACK AND FORTH WITHOUT IT GETTING STUCK OR OFF TRACK LIKE MY PRIOR SLICER. WELL WORTH EVERY PENNY!! I bought my first one in 1989 in Germany. After 10 or 15 yrs. I thought it must be getting dull, so I bought another one. But it still cut as good as the new one, So I gave my old one to a friend. She loves it. I bought one plus a bowl for my daughter for Christmas and she loves it too. It is so good to find a good product that still takes pride in their workmanship. I was hoping mine would fit on the bowl. I still use mine several times each week. Thanks for something good that will last! Wooden Storage and Gift Box Included! The Ultimate Grilling Tool. Frost Cookies, Cupcakes and Other Pastries With Ease. For Effortless Icing Application. Razor Sharp Ceramic Blade For Durability, Easy Peeling And Reduced Browning. Colorful Coasters That Cling To Your Beverage. Also Double As Drink Markers.